Can you identify this old building? To make it easier for you, I show 2 views taken from different directions. I took these pictures more than a year ago. At that time, it looked uninhabited, so just maybe it might not even be around today. 1) It’s located near the sea. 2) Up to a couple of years ago, it was headquarters for a certain sport association. But I believe this building is probably at least 30 to 40 years old. What it was originally; I have no idea. Hope some reader can enlighten us. 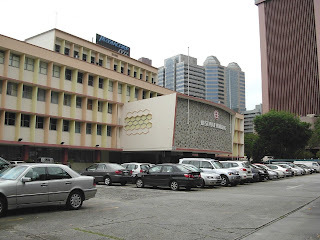 This building is located between Nicoll Highway (above photo, left) and Stadium Road. It is next to National Stadium car park B. Across the road (right of this photo) is what used to be the Marine Coast Guard HQ which moved out a few months ago. I used to go there quite often for my brisk walking exercise with my friend Chuck. At that time, my son used to have his kayaking training there. But nowadays they train at the MacRitchie Reservoir. At that time I saw a sign saying this building was the headquarters of the Singapore Netball Association. 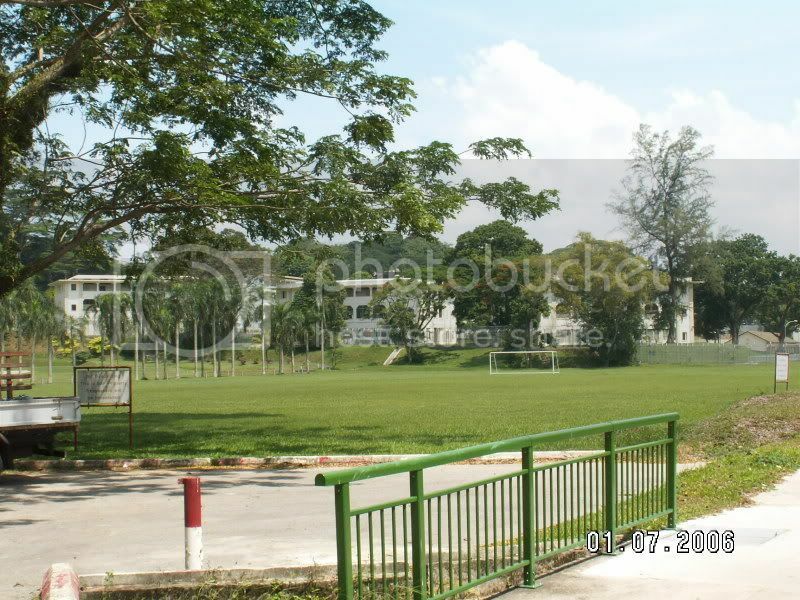 Subsequently that association was shifted to another location near to the Stadium Boulevard side. I took these photos because I suspect they will tear it down pretty soon when they start constructing the new Sports Hub. 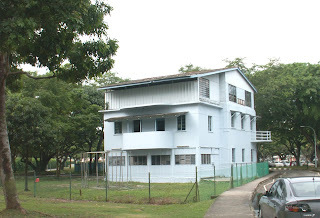 "This building was a look-out tower for aircrafts landing at the Old Kallang Airport. 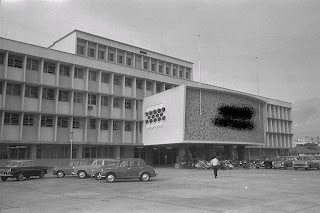 When there was Kallang Airport (up to 1955), it was used by the Royal Singapore Flying Club which later shifted to Paya Lebar Airport and now at Seletar Airport." Where was the location of Changi Grammar School? 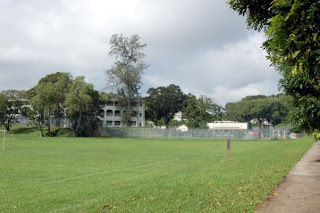 I am a bit confused by the discussion between Peter and Tony in the earlier post about the Changi Grammar School. Was it at Loyang Avenue or was it at Upper Changi Road? As it is quite difficult to follow the discussion without photos and maps, I have added these below. Now please continue the discussion so that readers will not be confused. 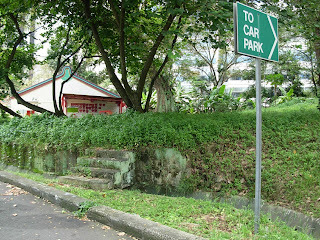 1) The Location mentioned by Brian Mitchell which is along Loyang Avenue near to Changi Village, near to the Maranatha BP Church. Below is a map of the location. 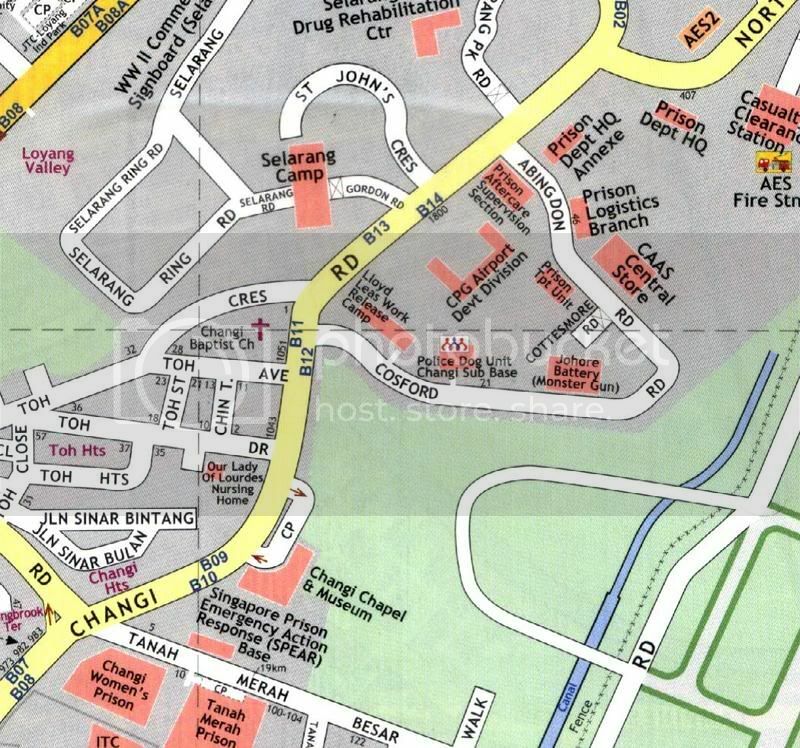 Below is a map of the Upper Changi Road in the vicinity of Cosford Road and Abingdon Road where the CPG Airport Development Division is presently located. In the early sixties, when television was not yet widely available because of the high cost of owning a tv set as well as the short transmission hours, our main form of news and entertainment was the radio. Unlike my friend Victor who lived in town, we did not have rediffusion in our kampong. Our favourite programme was the wuxia (Chinese pugilistic) stories told by the late story-teller Lee Dai Soh. But did you know that besides such stories, we also had radio dramas. These were usually in Cantonese and broadcast in the afternoon at around 2 pm, whilst Lee Dai Soh’s programme came on at around 6 pm. My siblings and followed these mini-series faithfully. It’s been a quarter century, and of course I am not able to remember most of the stories that we heard, but a few titles remain fresh in my mind. The first one goes by the title of Yat Sat Chook (pronounced in Cantonese) or “一失足“。 This is actually derived from the Chinese idiom, 一失足成千古恨，回头已是百年身。Roughly this says that one wrong step can lead to a life time of regret. The reason why I could remember this title was because we gave it a nickname of our own. At the start of the programme, there was this announcer who read out the title in a solemn drawl - Yat …Sat … Chook. We thought it was rather comical and promptly changed the title to Yat Putt Chook which, in Cantonese, says, one scoop of porridge. There were some stories which were actually adaptations of famous English classics. I seem to recall that Charlotte Bronte’s Jane Eyre was one of them. Do you know what was Jane Eyre in Chinese? It’s 简爱. I also vaguely recall that Emily Bronte’s Wuthering Heights was another. It’s Chinese title was 魂归离恨天. Yet another one could be Jane Austen’s Pride and Prejudice. But I have to admit that my memory could be playing tricks on me. It could be that I actually saw the Cantonese movies of these stories in the South Country Theatre in Kampong San Teng and got things mixed up. Anyway, I hope some of my older Cantonese readers like Zen or Frannxis can help me out. But one title I am quite sure about was Lei Pik Wah (李碧华). Do you know what was the original title in English? It’s Rebecca by Daphne du Maurier; which incidentally was a wonderful love story with a bit of mystery. My siblings and I enjoyed this story tremendously. I think my love for reading English classics could be attributed in some way to these radio dramas. Anyway, I hope my young readers have gained a bit of knowledge of Singapore’s history today. I bet your history teachers never taught you this in school. 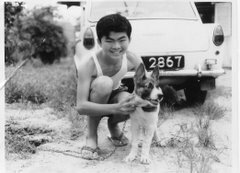 It has been a while since I wrote anything about my days in Singapore as a young UK teenager at RAF Changi in early 1960. I have not written about my experiences at school – partly because John Harper has already dealt with his schooling experiences in more detail that I can remember. 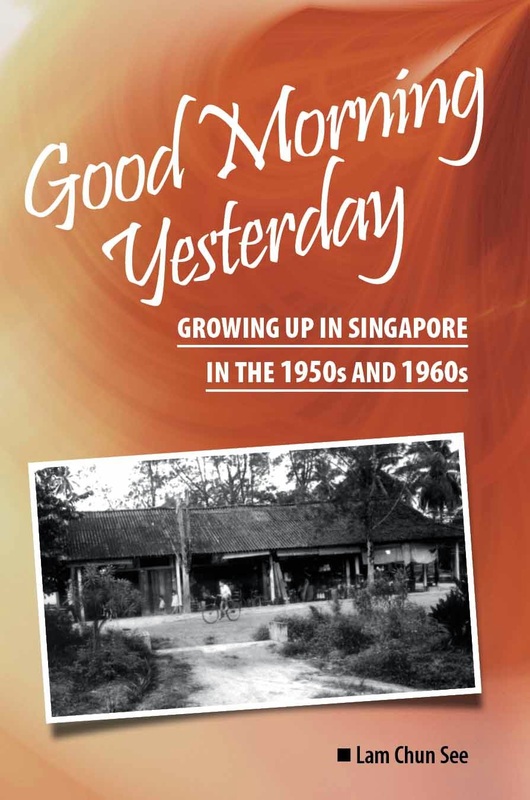 But I also can’t recall seeing anything much on Good Morning Yesterday about the school day experiences of Singaporeans of my generation – so perhaps this blog will encourage something more from Spore readers. I arrived in Singapore from a cold grey London which suffered from dreadful smoky fog - which sometimes led to us being sent home early from school. My London school had been a new state of the art comprehensive (ie non selective) school. I could walk to the school which was only a mile away from my home wearing the traditional school blazer, shirt, tie, v-neck pullover and long flannel trouser uniform. There could not have been a greater contrast with Changi Grammar School in Singapore. I found myself dressed in a uniform of khaki shorts and white shirt, I was suffering not from smog but from the steamy heat and I was sat not in a modern multi-story building but in an attap hut with chicken wire windows! 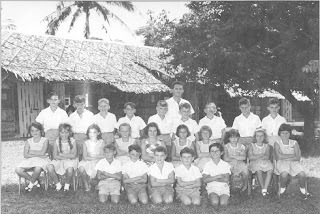 I don’t have a picture of the huts with my class but here is a picture of a primary school class in the same row of huts at Changi. 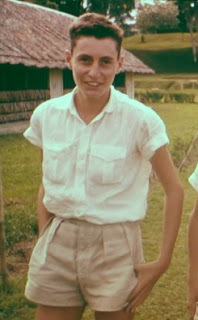 And here I am in my school uniform – with the regulation long shorts turned up inside to make them shorter and more fashionable! Getting to school was the first challenge to me. I had suffered from travel sickness in buses and now I had to travel from the Orchard Estate (my first home) in one of the Gharries – service buses which brought kids to the three schools (Grammar, Secondary Modern and Primary) that occupied a central location in the then RAF base. I remember telling myself on the first day that I would no longer be travel sick – and I never was! The gharries arrived from the various places in the Changi area occupied by service personnel, dropped us in the central playground – to which they returned at the end of the school day to pick us up. There was one advantage to being in the gharry that arrived first – a quick exit and a run up to the coke machine in the ground floor corridor of the barrack block would get you one of the first cokes of the day. This would often be frozen – and for some reason this was considered as a big treat. The school day was relatively short – an early morning start and finish at lunchtime Monday to Saturday, although there were sport and other activities on two afternoons each week. We followed the UK curriculum of course – most of us were there for only two and a half years and had to fit back into the UK exam system on our return. Our teachers were, I think, in post for a longer period of at least five years. So by the time you left the school to return to the UK virtually everyone in your class would have arrived after you! 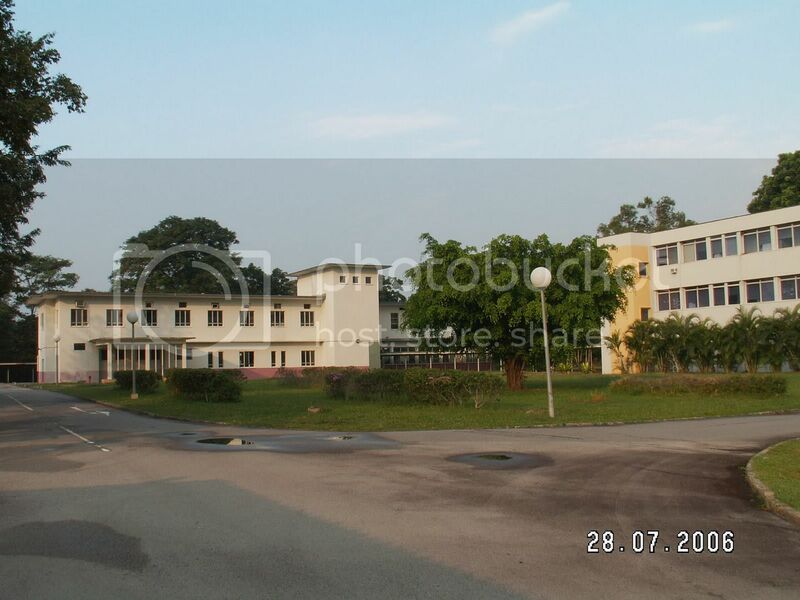 Although I found myself based first in the attap hut, most of the school occupied a couple of barrack blocks, three storey buildings with a corridor around the outside of the building onto which the classrooms opened – windowless and without air conditioning of course. So after a couple of terms in the attap hut I moved into the barrack blocks. 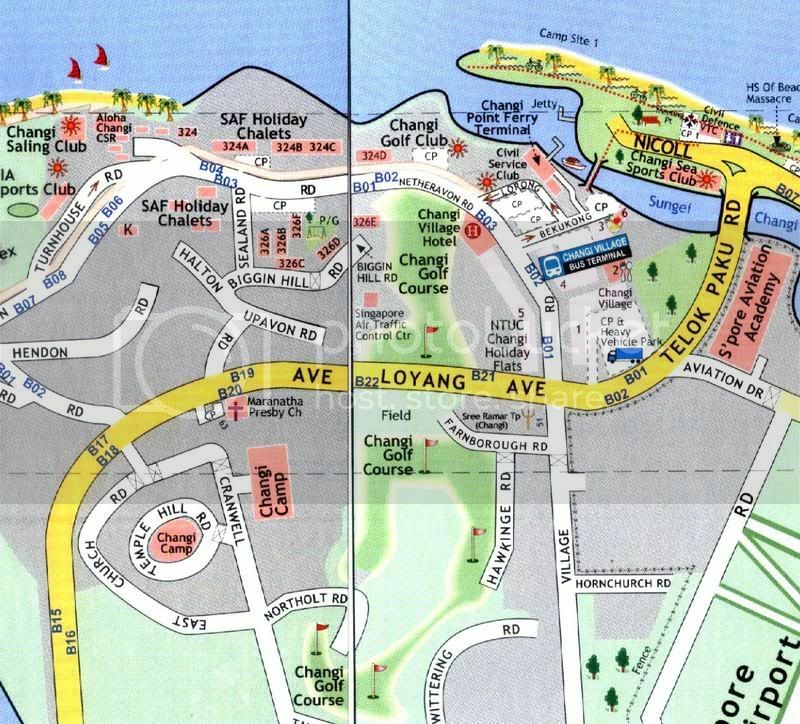 The barrack blocks are still there in Changi, now occupied (and no doubt much updated) for use by the SAF. John Harper took a photo on his recent trip – although the blocks now look much changed but there was evidence of other old school buildings. Did I enjoy the Changi school experience? To be honest I don’t recall benefiting very much from the education! Being in Singapore was an overwhelming experience, there were too many distractions and too much to see and do as soon as school was over – things I have written about in other blog pieces. 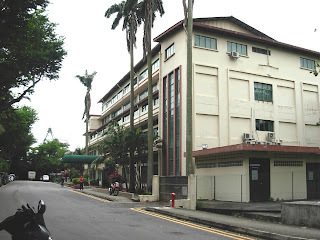 Reading Chun See’s blog and visiting sites like Memories of Singapore has made me acutely aware of one thing – I knew nothing about other British Schools let alone schools for Singapore’s own population. What sort of school day did you Singaporeans experience? I recall hearing about schools operating a shift system to accommodate the growing numbers of school-children, was that true? And what sort of buildings did you have – and was there air conditioning in schools, then or now? Both my elder brother Chun Chew (Zen) and myself have written about our school days. You can read our stories here. The old building that was shown in the previous Old Buildings Quiz is called Palmer House. It used to be home to the Chinese YMCA (Young Men Christians’ Association), later renamed Metropolitan YMCA. I remember this place from 4 decades ago. In 1967, I came here to collect my prize for winning the Inter-School General Knowledge Quiz. I was in Secondary 1. I also came here to play badminton. Today, the badminton courts have been converted into offices (walk in through the front glass door and straight ahead were the courts). There was a Hainanese canteen operator then who had a signature dish called "Minute Steak" - green peas, French fries and beef. 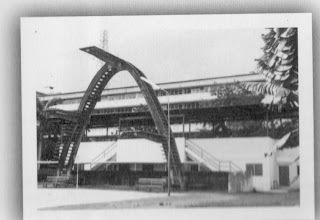 I am not sure about it now, but in front of the building, facing what is the ECP today, was the swimming pool (raised above the ground) and a concrete diving board like the old Chinese Swimming Club. The swimming pool was facing the curved curved end of YMCA which is now occupied by the Keppel Flyover. Under the curved building was the open space for customers to dine. The kitchen was just behind it - the present small door in that building lead to the old kitchen. Palmer House lies at the end of Palmer Road and is just behind the Singapore Polytechnic. In those days, Palmer Road was very different from what it is today. The road to get into Palmer Road is different from today's direction. You had to pass the temple (on your left) and then drive under a row of wooden houses (imagine going to a cowboy fort). 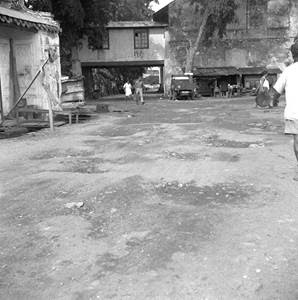 The coolie quarters was also a part of the Palmer Godowns. Below is a map of the vicinity scanned from my 1963 street directory. You can compare it with that of a recent map. It looks like the present Palmer Road is not the same as the old one – probably has been added on in recent times. As you can see, at that time there was no ECP. That place used to be sea. But, interestingly some of the old places are still there. 1. The Hock Teck See Temple is still there. In the old days, it was spelt Ho Teck Su. 3. The Parsi Burial Ground of course is no longer there. But you can still see some step which presumably led to it from Palmer Road. 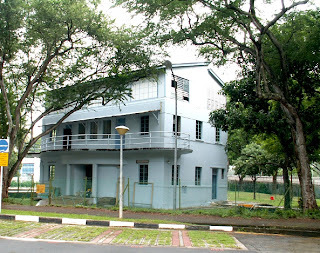 For more information about the person after who Palmer Road has been named and the history of this place, please go to the Singapore Infopedia website. Can you identify this old building? Victor was right. It’s quite meaningless without hints. You either know or you don’t know. So I make it a multiple choice question. A) The Foo Chow Building in Plummer Road? B) The Palmer House in Palmer Road? C) The Diamond Industrial Building in Paya Lebar? More history and rare old photos of this place and its vicinity in a couple of days. PALMER HOUSE located at Palmer Road, just behind the former Singapore Polytechnic. It was built in 1954 and known originally as the Chinese YMCA; later renamed Metropolitan YMCA, and now Palmer House. Zen was right. Those are cranes in the background belonging to the PSA's Tanjong Pagar Container Port Terminal. That place should be familiar to Zen. He had many lunches at the nearby Tian Lye Street in the sixties. Here're a couple of photos of the building taken yesterday. (I have enrolled for a course at the TESOL Training Centre and will be going there quite freqently in the next few months). Anyway, I will let my friend Peter tell you more in the next article. Hope can find time (have to scan and edit a 1962 map of the area) to put up his article and photos tonight or tomorrow latest. Please reserve your comments till then. Can you recognize the building in these two photos? The one on top was taken in the early seventies whereas the one at the bottom just a couple of days ago. I am not asking where this building is located. I want to know the name of the organization housed at this complex in the past. I think the older readers, should have no problem, but those below 40 or so may find it a bit challenging. So please let them have a go first. 7nine is right. 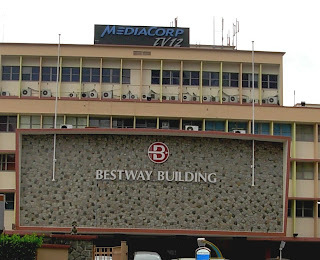 (See comments) It used to be the Spore Polytechnic located at Prince Edward Road and is now called Bestway building. And as you can see from the photo below, it houses the Mediacorp TV12 and other organisations. 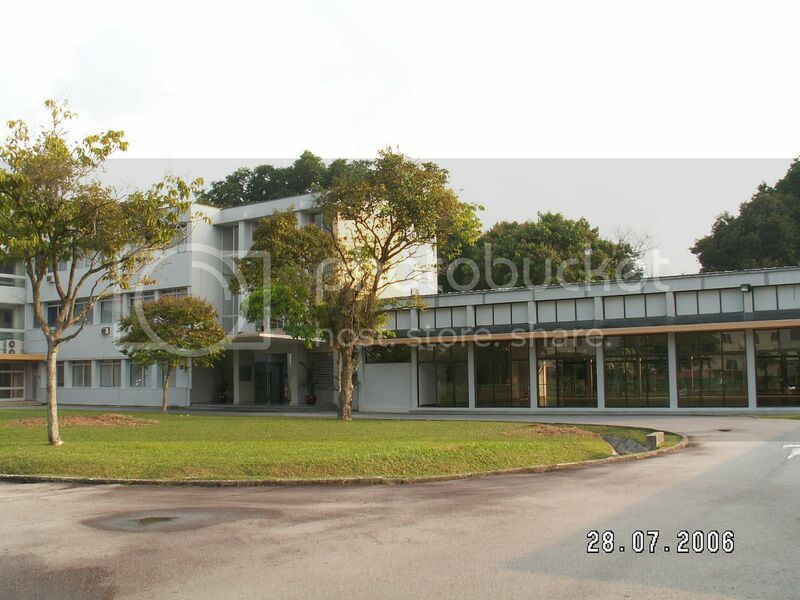 But did you know that it was also home to the University of Singapore's** Engineering Faculty? I studied there. This was during the early years of the Engineering Faculty and so they were temporarily housed at what was called the Prince Edward Campus. 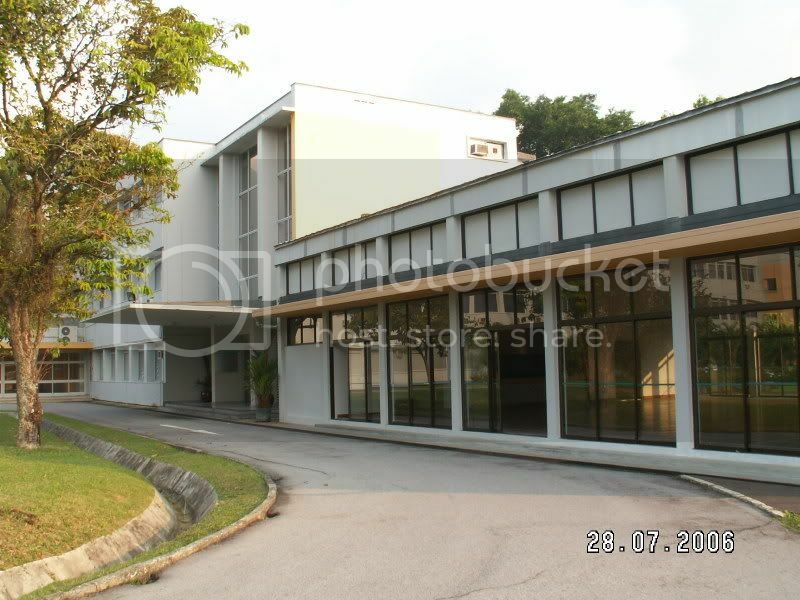 The main campus was at Bukit Timah and the Medical Faculty was at Singapore General Hospital. When the Kent Ridge campus was completed (in 1977? 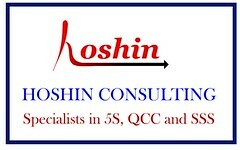 ), the Engineering Faculty was shifted there making it the first faculty to occupy the new premises. I was in the area last Thursday and decided to pay a visit and have lunch at the canteen. Of course I was armed with my camera and took several photos. Unfortunately, it was an cloudy day, and the pictures did not turn out well. Anyway, when I have more time, I will blog about my time in this place. I hope they don't tear it down soon. But I realized that some portions to the rear has already disappeared to make way for the viaduct. ** In those days, there were only two universities in Singapore. People referred to them as SU and NU - that's short for University of Singapore and Nanyang University. And, yes, there was also only one polytechnic.